Opening my emails this morning I learned the news that you have won the 2018 Woodlands Award in the category 'Best regional and National Woodland Organisation'. External validation may not be terribly 'Forest School' but I am happy to accept this award on behalf of all those FSA members who have given so much of their time and energy over the years to develop this association and to promote quality Forest School. That which the FSA has achieved is largely down to them. As a board member said the other day, 'the FSA needs its members more than the members need the FSA'. This point was highlighted this weekend during the national Forest School festival in Norfolk, with over 300 Forest School folk attending. This highly successful event was a wonderful opportunity for the community to connect, share and support each other. Like the FSA itself, it was an opportunity to be part of something bigger than any one person’s practice. A chance to meet people from a wide range of Forest School backgrounds and overcome narrow perspectives formed by the echo chambers that seem to exist everywhere these days. None of this would be possible without the tribe of very dedicated FSA volunteers who pulled it all together. There are less obvious ways in which FSA members support the organisation and the community. 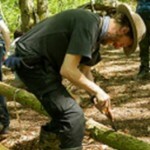 Every time someone speaks up for the 6 Forest School principles, when someone offers advice to another member, when they share their skills, or give up their time to be involved in national working groups or on local group committees, when they share and promote the work of the FSA, they are supporting our purpose. You can see the award logo below. It will be placed on the homepage of the website as a symbol of the progress we have made towards our purpose in 6 short years ... Quality Forest School for All. Well done to the whole association (tribe) for making this possible. Give yourself and the FS bod closest to you a big hug. It is great to hear that Forest School has won this award. I am a forest school teacher at Richard Bonington Primary and Nursery School in Arnold, Nottingham and we were also thrilled to get the e-mail from the Woodlands Awards to say that we were winners of the Best Forest School 2018 Award. It is very special to work in a school that embraces forest school for all children from the Nursery to Year 6.